In the first decade of the 20th Century flight captured the imagination of the world. Southern California played a key role in the invention of the aviation industry, beginning in 1910 when the first American air show was staged at Dominguez Field (in what is now the City of Carson). The exhibition drew leading innovators and pilots from around the globe – as well as a quarter million spectators who marveled at the daredevil displays of these flying machines. Prominent members of the Hollywood community were soon bitten by the flying bug, the most notable being the famed director Cecil B. DeMille (1881-1959) and Sydney Chaplin (1885-1965), the older half-brother of Charlie Chaplin. Although business competitors, they pioneered what would become the modern airline industry by offering the first scheduled commercial flights in the world. DeMille, a founder of the Academy of Motion Picture Arts and Sciences, was the most commercially successful director of his time. His credits ranged from the Squaw Man to the Greatest Show on Earth and the Ten Commandments. In 1918 DeMille founded the Mercury Aviation Company and built his first airfield, DeMille Field No. 1, across from the present location of Fairfax High School. Soon DeMille build a second airfield, DeMille Field No. 2, and moved his enterprise to the northwest corner of Wilshire Boulevard and Fairfax Avenue (which was then known as Crescent Avenue). Mercury Aviation operated a fleet of surplus World War I “Jennys” and offered popular sightseeing trips and charter trips. The airfield featured a gas station at the intersection of Fairfax and Wilshire that fueled automobiles on one side and airplanes on the other side. 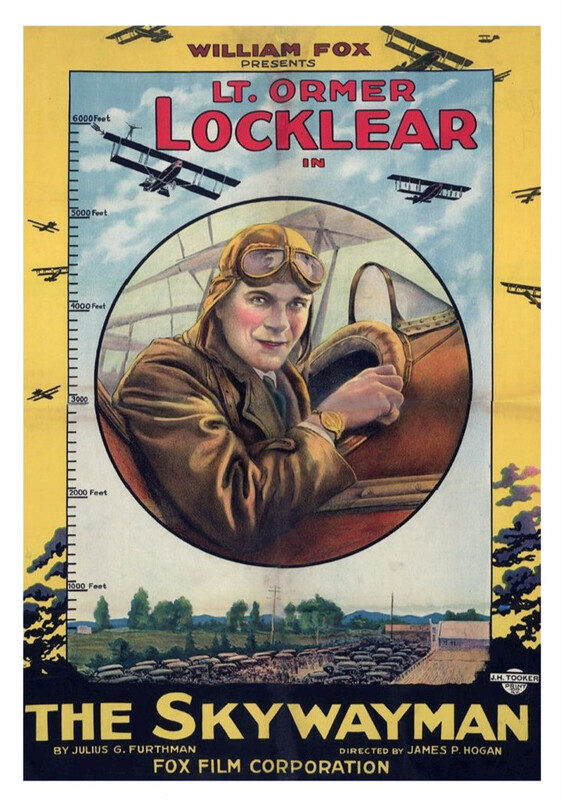 Mercury purchased its first new aircraft in the summer of 1920, a Junkers that was delivered to DeMille Field by famed flying ace Eddie Rickenbacker. In May 1921 Mercury launched regular scheduled flights carrying passengers to Santa Catalina Island, San Diego, and San Francisco, and other locales – becoming the first scheduled airline with multiple destinations in the world. The first passenger flight from New York to Los Angeles landed at DeMille Field No. 2. In the two years or so it was in operation, Mercury transported over 25,000 passengers without a single injury – but flying was expensive and still too much of a novelty to be fully embraced by the traveling public. The Mercury Aviation Company proved to be unprofitable and DeMille shut down the airline by 1922. The dramatic climax of the film required Elliott to dive a plane, carrying himself and Locklear, into some nearby oil derricks and appear to crash. The stunt was shot a night so that the giant floodlights illuminating the maneuver for the camera could be switched off at the last second to conceal Elliott pulling out of the dive, but the electricians missed their cue and the lights stayed on. Elliott, blinded by the bright lights, crashed the spiraling plane and both men died instantly. Not inclined to waste a spectacular stunt, particular one as realistic as this, it was utilized in the finished film. Mercury’s competitor in the air travel business was across the street at Chaplin Airfield, which was founded in 1919 by Sydney Chaplin. Chaplin was a stage performer and silent film actor before becoming his far more famous sibling’s business manager. The company offered observation flights for $10 and round-trip flights to San Diego for $150 (at a time when the average wage was $1,200 per/year). Obviously, the cost of air travel was very steep and Chaplin’s enterprise had a brief life span. Around 1920 Chaplin sold out to Emory H. Rogers, a business partner, who renamed it Rogers Field. Rogers Field was touted as the largest airfield in the west and continued in operation for about ten years. 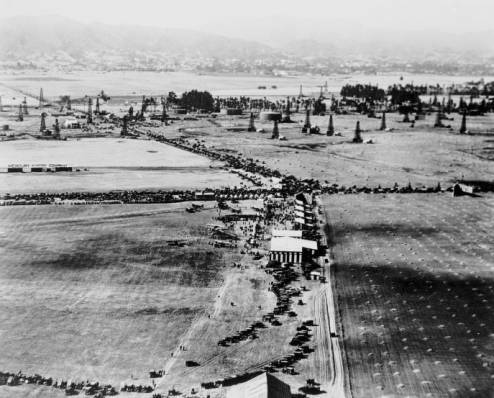 Rogers offered free use of the field to the City of Los Angeles as a municipal airport, but the surrounding real estate was rapidly becoming too valuable. In 1922 a developer named J. Harvey McCarthy began work on a residential district along the San Vicente Boulevard line of the Pacific Electric Railway. He utilized a derivative of his own surname and called the development Carthay Center. That same year another developer, A. W. Ross, and his partner, Hector N. Zahn, paid the then outlandish sum of $54,000 to acquire 18 acres of land along a dirt road that would become an extension of Wilshire Boulevard. The parcel, between La Brea and (by then) Fairfax Avenues, was ridiculed as “Ross’s Folly.” It is known today as the Miracle Mile. By 1931 both DeMille Field and Rogers Field had disappeared from street maps and the Miracle Mile’s brief – but important – role in the creation of the commercial airline industry was over. Demille Field No. 1 was located at Melrose and Fairfax. Cecil B. DeMille soon moved his aviation business to Demille Field No. 2 at Wilshire and Fairfax. Photograph circa 1918. DeMille Field No. 2, circa 1919. Enlargement of previous photograph. The airfield was located on the northwest corner of Wilshire Boulevard and Fairfax (then Crescent) Avenue. An undated painting by Ted Grohs of Omar “Lock: Locklear doing a headstand on the wing of a Jenny above the De Mille & Chaplin Airports on Wilshire Boulevard and Crescent Avenue (now Fairfax Avenue), circa 1920. Aerial view of Chaplin/Rogers Airport, circa 1920. Wilshire Boulevard is the tree lined street; Fairfax runs from the left to upper right corner.